I paid a visit to the Hasson & Wong clinic last Friday to have the good folks there look at my results and have some high quality photos taken (by Jotronic) against the famous blue wall. Dr. Hasson and Joe spent about 1 1/2 hours with me to sit down and evaluate my results and talk about the future. I could not be happier with my results and the HT journey with H&W has been a very positive experience from beginning to end. It’s one of the best things I’ve ever done for myself. Regaining something that you once thought was lost forever is an amazing feeling that’s hard to describe. Like for so many other folks hairgreed has indeed come to me a few times, but I’m holding off any further work for now. Dr. Hasson assessed my crown and didn’t detect any miniturization around the crown area. I’m taking 1/4 Proscar every other day (no sides) and it seems to be working. I’m not sure if it has grown any new hair per say, but my crown feels solid and the overall caliber and thichness of the individual hairs have improved. My indiviual hairs are quite fine so it takes a lot of them to achieve proper density. 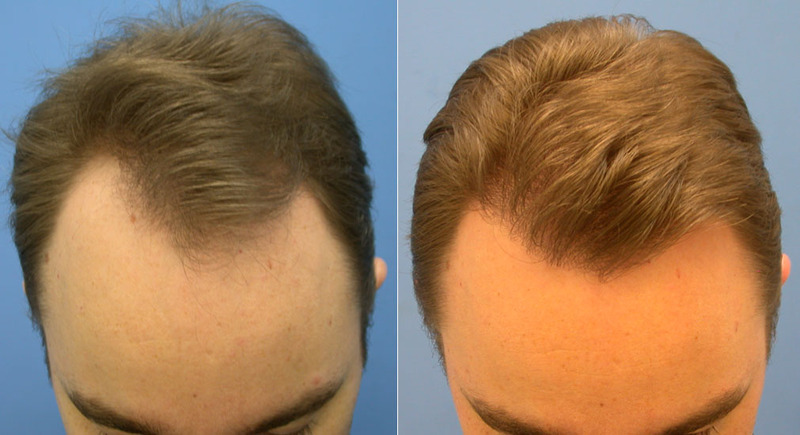 However, it has the advantage of being great for creating a very natural looking hairline. I’m at the end of my HT journey and this is my final post. Godspeed to everyone who is about to embark on a quest for more hair! » Jotronic) against the famous blue wall. » evaluate my results and talk about the future. » thought was lost forever is an amazing feeling that’s hard to describe. » the overall caliber and thichness of the individual hairs have improved. » a very natural looking hairline. » everyone who is about to embark on a quest for more hair! Nice result, and I do wish you the best of luck, but I doubt you are at the end of your journey, because the hair you had in the before pictures (in the danger zone so to speak) and still have is also genetically programmed to fall out someday too. So really once you blaze down this trail it is really a lifelong endeavor I feel for most of us. Just my 2 cents, and not trying to bring you down, your result looks great, this is just one of the things people need to think about is the hair that they currently have pre-op, and when will they need to address that hair when it starts coming out as well. Unless ofcourse if you do not plan on replacing that hair. » » Jotronic) against the famous blue wall. » » evaluate my results and talk about the future. » » thought was lost forever is an amazing feeling that’s hard to describe. » » a very natural looking hairline. » » everyone who is about to embark on a quest for more hair! » Best of luck to you. Did you ask for the higher hairline or is that what they thought was best for your situation? This looks good, but I would personally like to see your temples filled in a bit more. This is a nice subtle result. 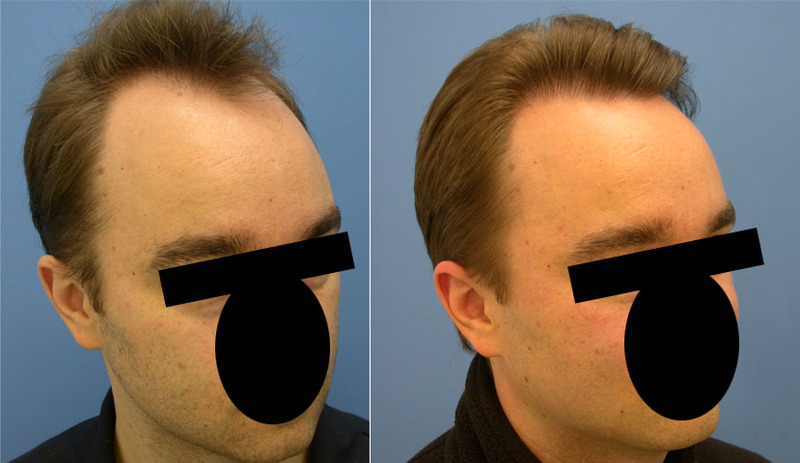 It looks natural and, even with a conservative approach, your hairline/facial frame look much improved. Congratulations! » programmed to fall out someday too. Notice that I said that I’m holding off any futher work for now. I have about 5000 grafts left in the bank to address future hairloss. Neither grand dads nor my father went beyong a NW4 and my hairloss is slow, so I’m not too worried. » » programmed to fall out someday too. 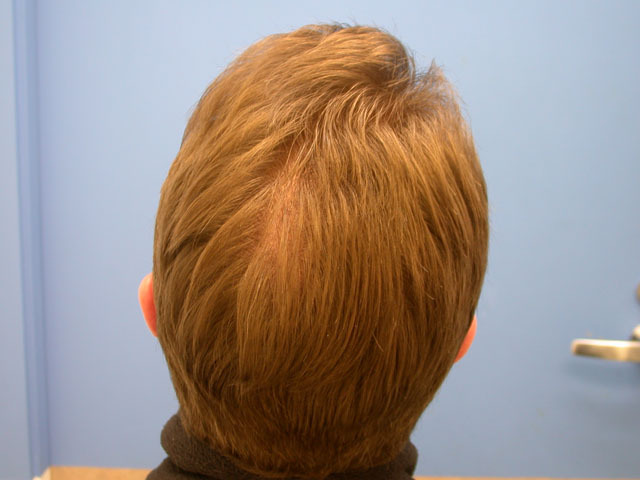 » have about 5000 grafts left in the bank to address future hairloss. » slow, so I’m not too worried. 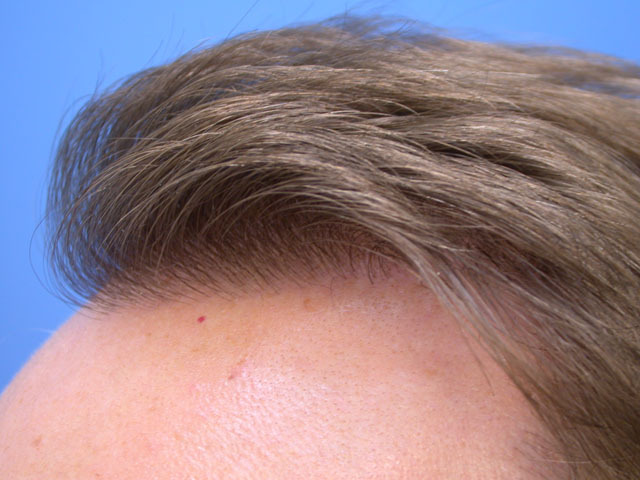 I like the way the hair line is staggered and not too low, very natural look for you. 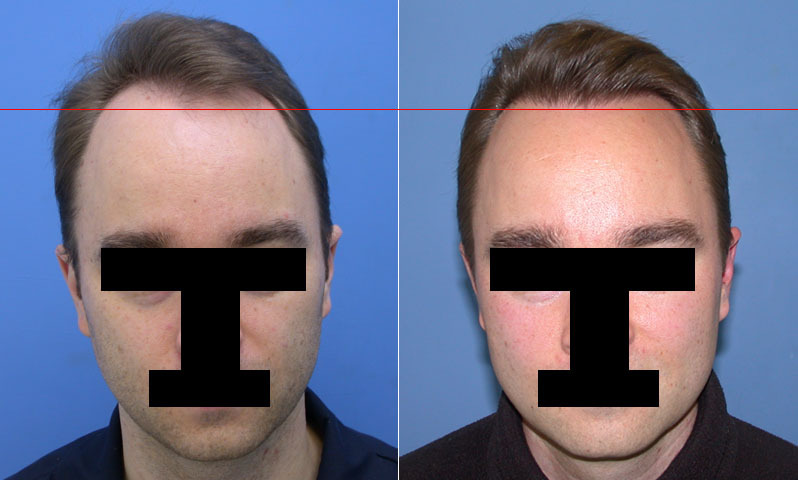 Are there any pictures of after the op, the placement of the grafts, because from other results 3400 seems a lot considering the hair line was not lowered and most of the work seems to be in the temples. Was a lot placed within the native hair? Good to see pictures if possible. First off, the result looks really good and it looks very natural, for those of us who have very fine hair its a compromise btw naturalness and coverage. I do however feel that its not one of those Hasson WHOA type of cases, or transformation cases. 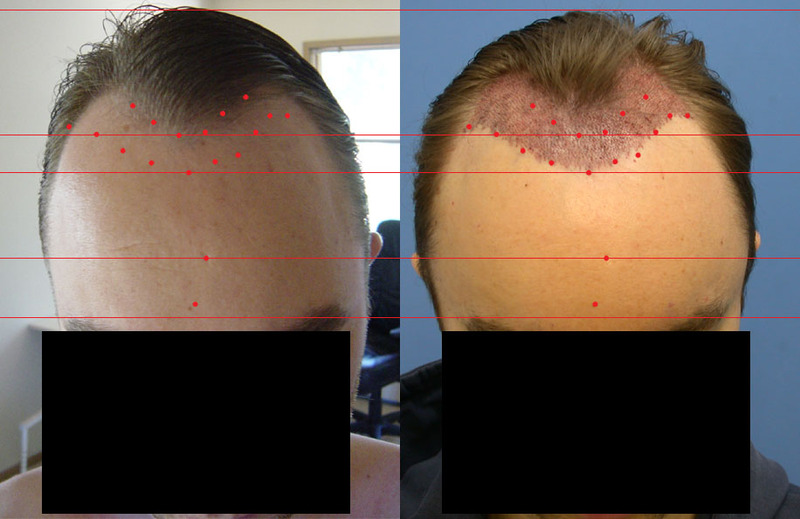 For 3400 grafts and seeing your before and after pics, I dont know where they went. I understand that your hair is fine but your hairline was not lowered nor were temples closed very much, so wheres the catch. At any rate if you are happy, thats whats all about, isnt it! It would be good if you put a 3rd photo to the right perhaps with the same red horizontal to show the after result, its just that on the pics from the 1st page its doesnt show the before and aft harline very clearly, but at any rate now with these 2 pics it becomes clear. One final observation, you hair must be very fine, true? » » wheres the catch. » any rate now with these 2 pics it becomes clear. » One final observation, you hair must be very fine, true? » » » wheres the catch. How does your crown look? » How does your crown look? Check the first post in this thread for a pic and description of my crown.